No, we can't all get along on health care. It’s true that Kennedy was the consummate dealmaker. His determination to reach across the aisle reflected, in no small part, his regret over one time he didn’t--during the 1970s, when President Richard Nixon put forward a health care reform proposal that Kennedy and his liberal allies rejected as too timid. But the wistfulness for Kennedy’s deal-making and, more broadly, his bipartisanship, overlooks a key detail. The deal on health care that almost came together in 1973--like the deals Kennedy later made on No Child Left Behind, immigration reform, and the Medicare drug benefit--involved Republicans who were willing to be part of the reform enterprise. Such Republicans are almost impossible to find today. During the past year, Republicans have frequently said they want to work with Democrats. But the real story of the last few months is how unserious those pledges turned out to be. Although you wouldn’t know it from their rhetoric or the media coverage, there are not one but two ostensibly bipartisan proposals out there right now. Either of them could be the template for successful reform if even a few Republicans started pushing them seriously. But, even the ostensibly reasonable Republican senators whom Democrats have tried to engage--Mike Enzi, Charles Grassley, and Hatch--just aren’t interested. And it appears they haven’t been for a while. The challenge, or so it seemed, was finding a way to accomplish these goals that meshed with conservative sensibilities. In practical terms, that meant relying heavily on private insurance to bring coverage to the uninsured, much as Nixon had proposed, rather than relying heavily on expanded--or even newly created--public insurance programs. It also meant minimizing taxes on the rich and fostering a sense of individual responsibility. Earlier this year, a group of former Senate majority leaders--Republicans Howard Baker and Bob Dole, along with Democrats Tom Daschle and George Mitchell--showed how that might be accomplished. After negotiating with each other for more than a year, as if they were still in office and representing their two parties, the group (minus Mitchell, who had since joined the administration) unveiled a fully fledged health care reform proposal in June. They released it through the Bipartisan Policy Center, a think tank they’d establish precisely to advance proposals like these. And, at least on paper, it looked like the kind of scheme members of both parties could support in good conscience. The Center’s proposal had the same basic architecture as the plan Obama put forward in his presidential campaign and that congressional committees have been debating this year. Everybody would have to get insurance; in exchange, government would make sure everybody could get insurance, by subsidizing the cost for those who needed financial assistance--and by creating a marketplace in which people without access to employer policies could get coverage regardless of pre-existing conditions. Still, it was hardly everything Obama or the Democrats would have wanted. Instead of a single public-insurance plan into which people could enroll, the Center’s proposal would have given states the option of creating independent insurance plans to compete with private insurers; it allowed the federal government to step in with its own plan only if, after five years, there was evidence the system needed more competition. This was an effort to satisfy conservatives, who believe a public plan might drive private insurers out of business and, ultimately, starve doctors and hospitals of necessary resources by underpaying them. But Baker and Dole’s endorsement didn’t move the Republican caucus in Congress, which barely acknowledged the Center’s proposal. Instead, the Republican leadership continued to oppose Democratic proposals outright, while those few members willing to talk about it kept pressing for plans that would be even less generous--a lot less generous--than what the Center had put forward. Enzi, in particular, wanted to minimize the financial assistance going to people buying insurance through the exchanges. Democrats had hoped to make subsidies available to people making up to four times the poverty line. Enzi proposed making subsidies available only to people making two-and-a-half times the poverty line--or around $55,000 per year for a family of four. As the Center on Budget and Policy Priorities has concluded, “substantial numbers of people with incomes modestly above 300 percent of the poverty line could face difficulty paying the full price of coverage. . . . This could leave the family short of funds for other expenses such as housing and child care.” And the $1.2 trillion price tag, the one lower than many Democrats wanted? Republicans have been saying reform can’t cost more than $1 trillion--and should probably cost a lot less. Of course, the Center’s proposal wasn’t a real bill. But the Healthy Americans Act--the bill that Ron Wyden, the Democratic Senator from Oregon, unveiled and began pushing back in late 2006--is real. The Healthy Americans Act is a completely different kind of reform: It would get rid of employer-sponsored insurance as it now exists and move to a system in which virtually everybody would buy coverage on their own--again, through some sort of structured marketplace in which the federal government set standards for benefits, made sure they were available to everybody, and provided subsidies for people who needed them. Although Wyden is a liberal Democrat, he crafted the proposal with Republicans in mind--seeking to reach what he called “a philosophical truce” between left and right. It is still the only proposal on the table that pays for itself within a few years, then starts to show actual savings after that. It would provide coverage entirely through private insurance, eventually folding in parts of Medicaid. And it would do all of this without raising taxes on the wealthy, at least not directly. Money for the program would come primarily from eliminating the existing tax exclusion on group health insurance, so that there would be no new taxes targeting the wealthy explicitly. It was, in many ways, a conservative proposal, as the opposition of prominent liberal groups attested. And Wyden scored an early victory when he secured, as a co-sponsor, Bob Bennett of Utah--a Republican senator with solid conservative bona fides. “It’s the right time,” Bennett said. “[W]e have a situation in Congress that would lead both parties to want to have a solution.” Over the next two years, a handful of additional Republicans agreed to co-sponsor Wyden-Bennett or its mirror version in the House. If Congress was to pass a bipartisan bill, surely, this was the chance. But, presented with that opportunity, Republicans refused it. With one or two exceptions, even the legislators co-sponsoring the measure did not in fact seem to support it. When asked about it, they would inevitably refuse to endorse the particulars and call the proposal--as a spokesperson for GOP Representative Mike Castle did in an interview--“a great conversation starter.” And, while Bennett still seems committed to the bill, it’s hard to know if that will last. The Club for Growth--a conservative group--began running advertisements in Utah, attacking Bennett for his advocacy of the bill. Bennett, in turn, has recently vowed to “kill” Obamacare, which suggests that combining the bills to produce a true compromise--a possibility others have certainly entertained--is not an option in his mind. The White House and its allies seem to grasp that Republicans (except for Maine Senator Olympia Snowe) just aren’t interested in promoting health care reform anymore. After Enzi gave a radio address in which he attacked Democratic health care plans, White House Press Secretary Robert Gibbs told reporters, “I think Senator Enzi’s clearly turned over his cards on bipartisanship and decided that it’s time to walk away from the table.” Gibbs didn’t say anything about Grassley. But, after a string of comments attacking Democrats and the revelation that Grassley is now sending fund-raising letters asking for support so he can help defeat the Democratic health care plan, the administration has apparently given up on him, as well. And yet, negotiations will go on, between liberals and those who remain at the table--conservative Democrats, who have their own qualms about the direction reform is headed. One issue is how much to spend on reform--a question that depends on Democrats’ willingness to find new revenue, in the form of taxes or savings elsewhere, and on which the plan’s ultimate generosity will depend. Another issue, naturally, is the public plan, which more conservative Democrats continue to talk down. Still, these are more differences of degree than of kind. At the end of the day, centrist Democrats may want less-ambitious legislation, but they still want legislation. Given their preferences, it wouldn’t be at all surprising if they ended up endorsing--and, finally, enacting--something like the measure Baker and Dole embraced. Which wouldn’t be such a bad thing. The Baker-Dole-Daschle proposal still isn’t everything liberal Democrats want. But it’s far more ambitious than anything than the Enzis of the world would tolerate--and a measure that would accomplish much, if not all, of what liberal Democrats can realistically hope to achieve in the prevailing political environment. In effect, conservative Democrats now occupy the political space that moderate Republicans once did, years ago--a place on the ideological spectrum that tends to look upon government more skeptically, perhaps, but still recognizes its place as a protector of economic security. 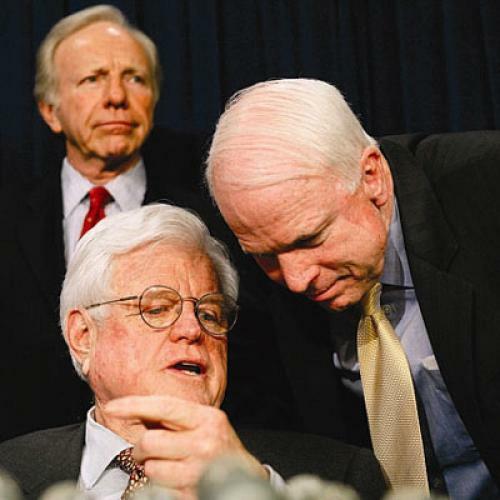 These are the people with whom Ted Kennedy used to make deals--and with whom liberals can still find common ground, even as they wish today’s Republicans good riddance.